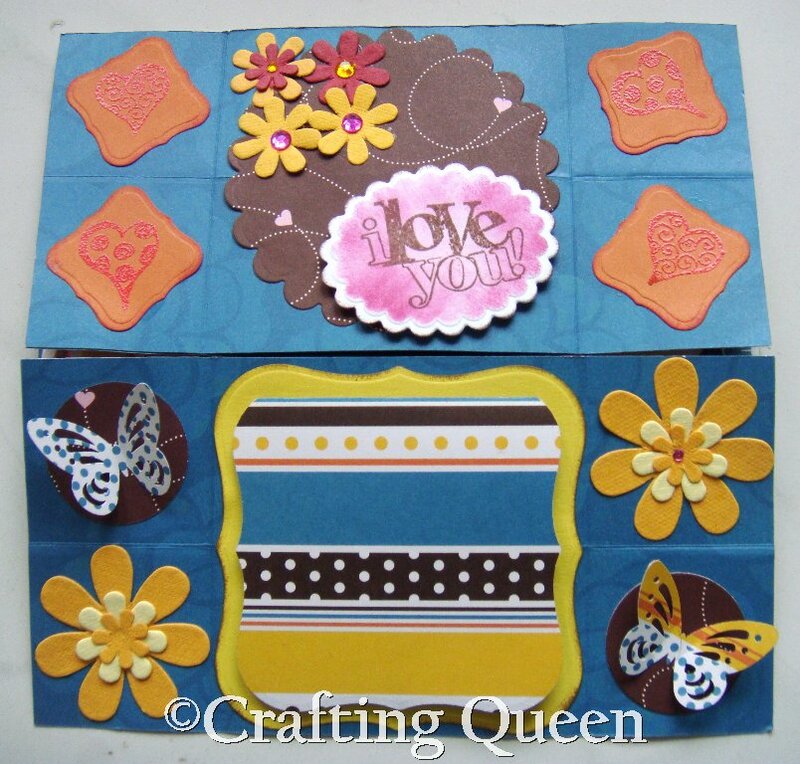 Crafting Queen: Valentines Day Card! I couldn't post it yest even though i tried so hard. 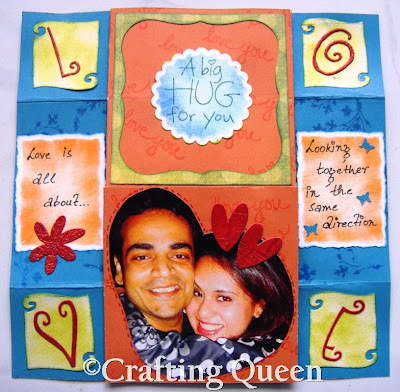 DH and i had a nice romantic dinner last evening and twas late by the time we reached home.I am sure am not so late :) So i made him a very special Valentines day card and the fun part was i locked myself in a room on 13th Feb evening to finish it! LOL! He is one curious cat! I managed to complete it on dot 12 am and gift it that very moment! Phew! DH loved the never ending card I had made for mom so i knew what he wanted. 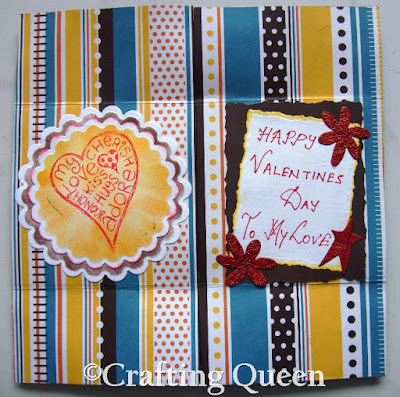 I am quite bored using red for love cards so i gave it all a new meaning with bright yellow, orange and blue Patterned paper from Pebbles Inc. I added some of our pics before marriage as well to give it a scrapbook luk! And DH loved it!! He kept folding it back and forth smiling and i was so so excited to see him play around with the card like a kid! ha ha....Before i blabber more here is the card!! Aweee, this is really cute Karuna!! very sweet card! lovely card. and what a riot of colours! This is so cute..I love that you gave yourself bunny ears (a la Playgirl!!) Such cute pics..Did I ever tell you that you both make a cute cute couple!! Gosh you are really thoughtful, I didn't make anything for my DH! ahhh!! this is soooo sweet..loved the color combo! DH is a lucky man! I love your card down to the very last detail. The final result is a perfect example of your creativity! Thanks for sharing with us at Stamps R Us and good luck. Lovely creation dear. Nice pics. too. Awww...what a sweet creation! Love those photos...especially the ones when the two love birds are gazing at each other! This is very nice- I love all of the pictures. Thanks for joining the Stamps R Us Challenge ! 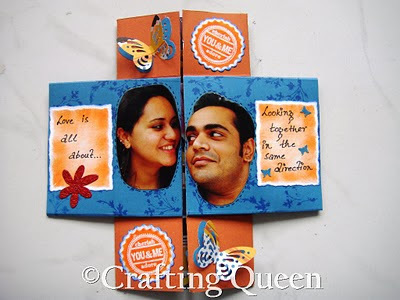 What a fab project and a fab couple! :) Never ending fun it sure is!